Our list of new books is updated. Last month, the Law Library received a wide variety of materials, covering everything from abortion to the WTO. Although I broadly disagreed with Scalia’s personal and judicial philosophy, he is a very important figure and justice. … I wanted to present his philosophy fairly. It is critical for the development of the law that we understand seminal legal figures, both scholars and judges. Scalia was very supportive of my effort, although there were so many questions that I would have liked to have asked him. He liked the idea that a liberal was writing the book and looked forward to debating me on it. 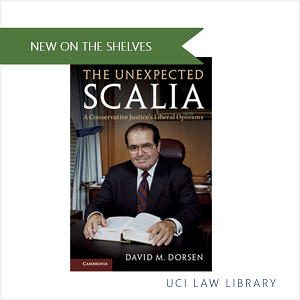 Check out the book upstairs in the Reading Room at KF 8745.S33 D67 2017. Our collection supports the scholarly and clinical work of faculty and students. Let us know if you have a suggestion for a new book. 1. Ronald Collins, “Ask the author: A critique of a concept – Dorsen on Justice Scalia’s jurisprudence”, SCOTUSblog (Apr. 15, 2017), http://www.scotusblog.com/2017/04/ask-author-critique-concept-dorsen-justice-scalias-jurisprudence.